On Sunday afternoons we like to have a large late lunch (because of church meetings) rather than a big dinner. We usually resort to breakfast comfort foods. 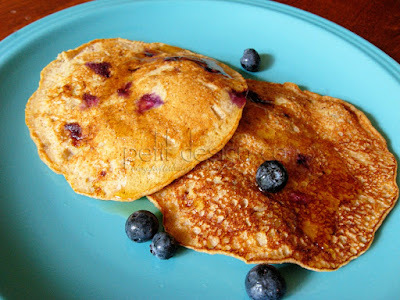 On this particular day we had Banana Blueberry Wheat Pancakes. These were really good with the freshly picked berries form that week. I also ended up using all wheat flour for this recipe. You can't beat real maple syrup on pancakes too! Are you starting to wonder why a lot of my recipes come from this website? Well a few months ago I was able to purchase the "2009 Healthy Cooking Annual Recipes" cook book when they were having an amazing sale! I bought 2 really nice cook books for $5 each and free shipping! I'm really loving this cookbook and so far we have loved every recipe we have made. So delicious and healthy! The nice thing is that most of the recipes are available online so I can share with you the ones that are actually good! See I'm doing all the work for you, weeding out the not so tasty recipes for you! This cook book is awesome! It has loads of quality images, quick recipes, easy ingredients, and lots of variety. Thumb through it the next time you're in a bookstore, you won't regret it.